Lionel Messi should be available for Barcelona's Champions League meeting with Celtic on Wednesday, having returned to training after sickness. The Argentina midfielder has overcome a bug that forced him to miss Saturday's 0-0 draw with Malaga. But he trained on Monday as the squad were joined by singer Justin Bieber. Striker Luis Suarez, who was suspended for Malaga's visit to Nou Camp, is available for a return to the visitors' starting line-up. Messi, 29, had been forced to pull out of Barca's matchday squad just hours before kick-off. The Spanish champions' stalemate means that Luis Enrique's side fell four points behind Real Madrid at the top of La Liga. Barcelona are two points ahead of Manchester City at the top of Champions League Group C.
They need only one point from their trip to Glasgow and their final game against Borussia Monchengladbach to secure qualification for the last 16. Celtic sit fourth and need at least three points from their remaining two games to overhaul the third-placed Germans and qualify for the Europa League. Messi has become the most effective player in terms of goals and assists among all the 32 teams after four Champions League group games - taking over from team-mate Neymar. The Argentine has scored seven goals in this year's tournament and provided the final pass for two more. Together with his Brazilian Neymar, they have scored or contributed to all but one of Barcelona's 14 goals. 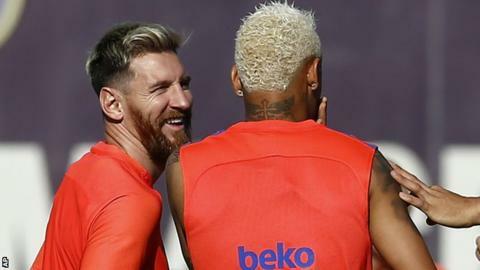 Neymar posted on social media photographs of Bieber's visit to the Spanish club's Monday training session. Captain Andres Iniesta and defender Samuel Umtiti are still sidelined with injury.